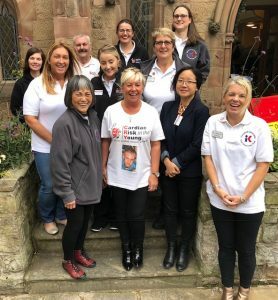 On Saturday the Knutsford First Responders, The Aaron Dixon Memorial Fund and Cardiac Risk in the Young (CRY) joined forces to provide free heart screening for 103 young people. Every week, 12 apparently fit and healthy young (aged 35 and under) people lose their lives to sudden cardiac death in the UK. A staggering 80% of these apparently healthy young people who die from young sudden cardiac death (YSCD) will have shown no previous sign of heart defects until it is too late – which is why screening is vitally important. If there has been a young (under 35) sudden death in the family, the family is entitled to be screened on the NHS but otherwise routine screening is not available. CRY offers subsidised ECG and Echocardiogram screening to all young people between the ages of 14 & 35. There is a simple way to diagnose most cardiac abnormalities. This is by having an ECG (electrocardiogram) test. Results are read by a cardiologist. For extra clarity an Echocardiogram (ultrasound scan) can also be done. The conditions can be treated, securing a future for those identified. The Knutsford First Responders are raising money for the next screening in Knutsford which will be held on 2nd April 2019 at the Knutsford Academy and will be available to all students of the school aged 14 or older. £5,000 is needed to fund this event, to donate please click here. 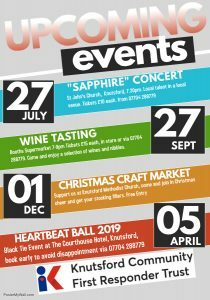 ‹ Over £800 raised at our Wine Tasting event hosted at Booths!